The man of many colours – Ranveer Singh has received lots of love from B-town, courtesy his impressive performances on his repertoire. And this much love was seen all over social media when the star actor turned a year older, a day ago. However, Ranveer was not in his hometown for his special day. He was shooting for his next, Simmba with Rohit Shetty and Sara Ali Khan in Hyderabad. Yet, away from home, his birthday was celebrated with much fanfare. Reports have it that Ranveer Singh was in for a surprise since he didn’t even get a hint of it until he came out of the vanity van. It so happened, that last evening, the birthday boy was sent to the van to get ready for a scene of Simmba. The actor, unaware of the preps, went in to get into his cop character. But when he came out, he was surprised with all the arrangements the crew had done for his birthday. 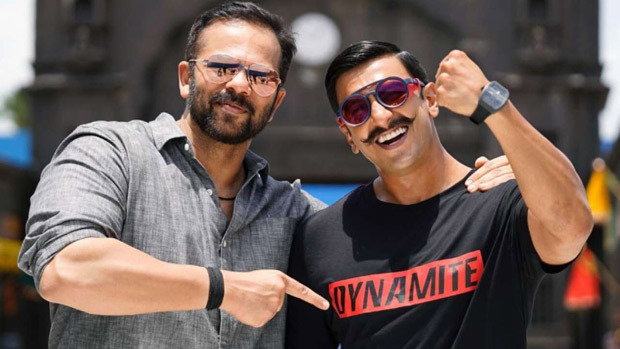 In fact, Rohit Shetty, who is collaborating with Ranveer Singh for the first time, added a special element to the star’s birthday. He called for a special Nutella themed cake for the actor, who loves Nutella and chocolates. And Ranveer, the enthusiastic actor that he is, gorged on the same. If reports are to be believed, Rohit specifically placed an order for this cake from the personal chef of the actor. Moreover, a Happy Birthday song too was playing in the background. May be that was the reference to the previous Instagram video he had posted about his birthday song! Whatever be the case, this video is a glimpse how thoroughly the superstar enjoyed the surprise. Besides that, we had earlier also reported about how Rohit Shetty presented a gift to Ranveer Singh much before the birthday. An early surprise gift for his special Simmba hero! It definitely seems that Ranveer had a blast celebrating his birthday amidst the hectic schedule with his Simmba team including Rohit Shetty and co-star Sara Ali Khan. Next 11 Little known facts about Ranveer Singh!